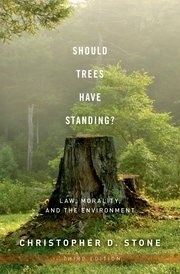 Originally published in 1972, Should Trees Have Standing? was a rallying point for the then burgeoning environmental movement, launching a worldwide debate on the basic nature of legal rights that reached the U.S. Supreme Court. Now, in the 35th anniversary edition of this remarkably influential book, Christopher D. Stone updates his original thesis and explores the impact his ideas have had on the courts, the academy, and society as a whole. At the heart of the book is an eminently sensible, legally sound, and compelling argument that the environment should be granted legal rights. For the new edition, Stone explores a variety of recent cases and current events--and related topics such as climate change and protecting the oceans--providing a thoughtful survey of the past and an insightful glimpse at the future of the environmental movement. This enduring work continues to serve as the definitive statement as to why trees, oceans, animals, and the environment as a whole should be bestowed with legal rights, so that the voiceless elements in nature are protected for future generations.